(NaturalNews) In the 2008 M. Night Shyamalan film The Happening, plants take their revenge on humanity by releasing a substance that makes people kill themselves. While such a scenario may seem farfetched, the case of giant hogweed shows that it's still not a good idea to underestimate what plants are capable of. Giant hogweed, which resembles a giant parsley plant, can grow up to 14 feet tall and produce 5-foot-wide leaves. It can also cause severe burns, scarring and even blindness to those who do nothing more than touch it. The giant hogweed plant (Heracleum mantegazzianum) is native to the Caucasus Mountains, between the Black and Caspian seas. It was introduced into Europe late in the 19th century and had spread to North America by the early 20th century. Although deliberately introduced as an ornamental garden plant, giant hogweed became naturalized and is now found across the northeast United States, as well as in Michigan, North Carolina, Oregon and Washington. It is also naturalized in western and eastern Canada. 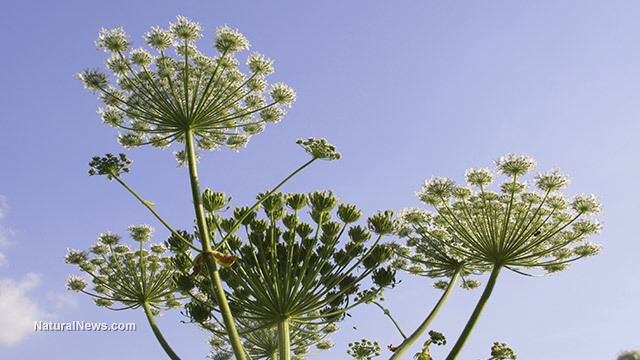 In addition to growing fast and tall enough to shade out native plants, Giant Hogweed can also pose a danger to humans. That's because touching the bristles that grow on its purple-blotched stems -- or touching a broken stem or leaf -- can bring the skin into contact with the plant's sap, which contains substances known as a glucoside phytotoxins. Put plainly, these chemicals react in the presence of sunlight, causing severe chemical burns. If they get into the eyes, they can cause blindness. "It's sap, in combination with moisture and sunlight, can cause severe skin and eye irritation, painful blistering, permanent scarring and blindness," says the New York Department of Environmental Conservation (DEC). In New York, the DEC has initiated a giant hogweed manual eradication program. Property owners are encouraged to take pictures of any suspected giant hogweed plant; if it is indeed hogweed, DEC may dispatch a crew to remove it. "Every property where giant hogweed can be removed increases biodiversity and helps to make outdoor areas safe for people to enjoy," DEC Commissioner Joseph Martins said. "It is important to raise public awareness to make sure that people know how to identify this plant, know not to touch it, know how to report it and know how to eradicate it." The DEC has removed the plant from 149 sites since 2006 and claims that it has contained it in another 1,100. At least 1,200 sites are still classified as infested, however. In Michigan, lack of federal funding caused the cancellation of that state's eradication program. Instead, property owners are encouraged to remove the plant themselves (following proper safety protocol) or hire a trained tree removal company. Approved removal methods in Michigan include chopping off the seed-containing flower heads, severing the taproot, or cutting or mowing young plants. All giant hogweed material should be disposed of in bags at a landfill. "There has to be a lot of vigilance to the site or it will come back the following year," said John Bedford, pest response program specialist for the Michigan Department of Agriculture. Giant hogweed typically grows along waterways and in wooded or open spaces, including yards, roadsides, vacant lots, fields and forests. If you come into physical contact with giant hogweed, you should was the affected area thoroughly with soap and water, and keep it out of sunlight for 48 hours. People should not panic upon sighting a plant that they believe to be giant hogweed, as the plant has numerous innocuous relatives, many of which are native to North America. "In general, only 2 percent of what's reported ends up being giant hogweed," Bedford said.